Christmas Wonderland 8 is rated 4.5 out of 5 by 46. Rated 5 out of 5 by Kimmycoo from Every Year I have bought these every year and so happy that the developers are continuing this series! I just love every scene, collecting the angels on this one, buying the little gifts, collecting souvenirs, and the achievements! You simply must add these to your Christmas cheer! The scenes will take your breath away, you just want to morph into them! 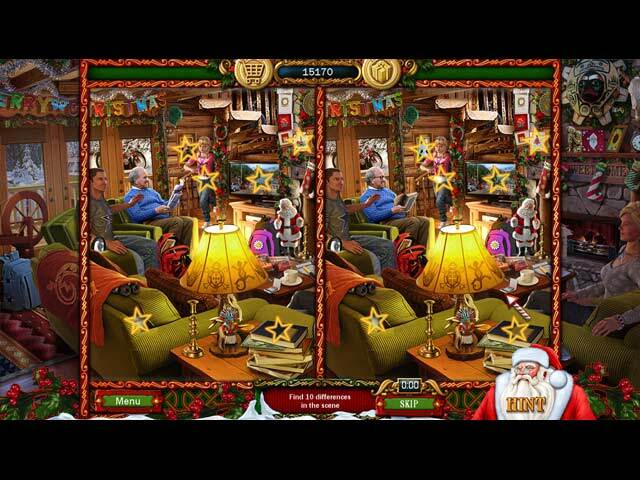 Rated 5 out of 5 by nannaroper from "Fun Hidden Object Game It's not Christmas until I can get my hands on these games. Have all games from CA, play them time and time again. It's not a criticism, just my sense of humour, next Christmas I would like the children to buy Mum and Dad a new T Shirt, if not I will still love these games. Merry Christmas to all. Rated 5 out of 5 by nelliebj from my christmas gift The much anticipated Christmas Wonderlnd 8 arrived and did not disappoint. I love them all. Yeah, the kids never grow up but that's ok by me. Keep them coming! Rated 5 out of 5 by cindymomof4 from At last...Christmas 8!!! I wait every year for the most recent edition of this game! I love all games by this developer! Wish more games like this came out more often...these are the hidden object games I love! Rated 5 out of 5 by je_peche from It's Awful. I love it. I look forward to this game, as poorly done as it is, every year. And make no mistake - it is wretched. Just awful, makes no sense, the various scenes are ridiculous, overcrowded jumbles, and it absolutely would not feel like Christmas without it!! Rated 5 out of 5 by Jake1999 from Finally! At Last! 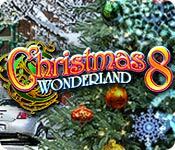 I was getting frantic waiting for Christmas Wonderland 8 for the PC to make it's appearance. I downloaded the android version to my tablet, but the details of the scenes are just too difficult for me to see on a 10 inch screen. It finally got here for my large screen computer. My Christmas season is now complete. This gets me in the Christmas spirit! I own several Casual Arts games, but Christmas Wonderland and Vacation Adventures are my favorites. This one did not disappoint me. I noticed characters from the Park Ranger series were in this one as well. Loved it. Very colorful, detailed scenes. I noticed some reviewers said it was too bright for them. But for these 67 year old eyes of mine, it was just right. This game reminds me of when I raised my own children. They didn't get much during the year, because we didn't have a lot of money, but we made sure Christmas was always special and we spoiled them with gifts and participated in several Christmas events. Keep up the good work. Looking forward to a new Park Ranger in the spring. That always gets me in the mood for going camping. Rated 5 out of 5 by bmn5772 from THE BEST CHRISTMAS GAME THIS YEAR Love this year's game........the graphics are so real.....one of the best games I've played in awhile......the music is superb! Rated 5 out of 5 by 1955raven from WONDERLAND 8 IS GREAT! THERE ARE NEW AND OLD THINGS TO DO,AS ALWAYS A LOVELY GAME! AN SO MUCH FUN FOR YOU! Rated 5 out of 5 by suloku from Best of the Christmas Wonderland Series! Merry Christmas! Playing this game was a great incentive to get my shopping and decorating finished. (Not yet finished, but I'm closer!) I really liked the story line and the Christmas music. The puzzles were just the right difficulty for me. Hidden objects, golden angels and lost-and-found items were challenging enough to keep me interested. I couldn't stop playing it until I finished the game, which isn't something I usually do (I didn't keep track of the time it took me, but I know it was certainly over the "Less Than 3 Hours" required to get that Achievement!) Like the previous versions of this series, this would be a good game to play with children or grandchildren. I think children who can read or are familiar with this series of games would be able to play with minimal adult help. Rated 5 out of 5 by puzzlegrandma from The most wonderful time of the year! Every year I am looking forward to this game and I truly hope they keep it coming. I gets me into the Christmas spirit and I enjoy playing it on these rainy and cold winter evenings. Well done! Rated 5 out of 5 by kdblueey from I'M BROKE, BUT I BOUGHT THIS GAME ANYWAY :) I haven't been a Big Fish customer for over a year now, but as soon as I saw this game, I jumped on it, paid my $9.99 and made myself comfortable. I simply couldn't wait to delve into the colors, music, toys, and the simple joy of the Christmas season. Even if you're a humbug, you won't be after playing this game. I like this newest version because the father is more prominent in the game. It has basically the same music as the other games, but the puzzles are a little different, and the objects, of course, are different and somewhat difficult to find. I highly recommend this game to anyone who loves the Christmas season. Rated 5 out of 5 by tobysue09 from I've got the Christmas spirit now!!! Love this game and all the other games this developer creates. These games are lovely, cheerful, and stress-free! Who doesn't need that in this crazy world!!! Rated 5 out of 5 by Justy1002 from A Holiday Favorite I always look forward to new installments of Christmas Wonderland. Really gets me in the holiday mood. It's fun and challenging, and just an all around good time! Rated 5 out of 5 by a41249 from Great New Installment To Christmas Wonderland As usual this next installment does not disappoint my expectations. This is wonderful game for the entire family to play and enjoy. I love all of the inter action with Emma and Mike. This game makes you want to be a kid again.It is pretty much much the same format as the other wonderland series,which I like. Come along and join in the fun. Rated 5 out of 5 by cyndrap from Great Game - Love the whole series Just love these have all of them now. This one is a good installment in the series. Fun, relaxing, good story, good all around game. My annual Christmas present to myself. Rated 5 out of 5 by chenpa from I so agree with pennmom36 I also look forward every year to the Christmas Wonderland games. The grandchildren start early in December asking when it is going to come out as they enjoy playing it. We enjoy all of games put out by this developer. The Park Ranger, Cruise Vacations and all the other games. Old School hidden object but something the whole family can enjoy. Wish there were more games during the year as I enjoy watching the kids having such fun playing. Rated 5 out of 5 by NancyNC from Now Christmas can come! I love these games, and all of the games by this developer. Don't get me wrong, I love more challenging games and some darker story lines too, but this is Christmas and it's time for some lighthearted fun and #8 doesn't disappoint. The game is great for the entire family. I look forward to the new release every year, and hope that they continue this series for a very long time! Rated 5 out of 5 by pennmom36 from EVENTUALLY THESE KIDS HAVE TO GROW UP, BUT I DON'T CARE IF THEY NEVER DO I look forward to Christmas Wonderland every year, it's not Christmas until this game is released! If you've never played any of these games, you really should, they are old school Hidden Object Games, but really fun! This dev also brings us Vacation Adventures: Park Ranger, and Cruise Director as well as several Holiday themed games. I say this every year, but it's oh so true, these games are Family games, they are designed to be enjoyed by the entire family, young and old will be delighted. It's not as easy as it looks at times, some of these objects are very well hidden! You can play in Casual or Challenge mode, depending on how fast you want the hint feature to recharge. Each scene has beautiful Christmas themed graphics and several listed items to search for within the scene. You will also need to find a Golden Angel, and each scene also contains lost and found items, which are shown as silhouetted shapes inside an icon on the left of the screen, the door will close when all items have been found. Some of the items to find are listed in red which means that the item is hidden in or behind something, such as a backpack, which can be clicked on to expose the item. Items in blue text require some type of interaction. After each seek and find game, there will be a mini game or puzzle available such as rotating puzzle pieces, putting together a puzzle one piece at a time, flipping over two ornaments at a time in search of matching pairs and even my personal favorite, spot the difference. Your score will be tallied at the end of each scene and you will earn a bronze star if you find all of the items to complete the scene, a silver star if you complete the level and find all of the angels OR all of the silhouetted shapes, and a gold star if you complete the level, find all of the angels AND all silhouetted lost and found items. You can replay any level at any time in order to find items you didn't find the first time. There are Trophy achievements to earn and you can visit the shop to buy Christmas presents to display on a shelf. There is a regular Hint as well as a Mega hint which highlights all items for a brief period of time, but you will earn an Eagle Eye bonus if you don't use any hints. Make this game one of your family traditions, enjoy! Rated 5 out of 5 by 2020moonlanding from Lovely Edition to the Series Christmas Wonderland 8 is finally here! If you loved the first 7 chapters you will love this too. The gameplay is the same with hidden objects to find and silhouetted items to collect as well as angels in each scene. Between each HO game there are puzzles and a gift shop to buy presents. Happy holidays! Rated 5 out of 5 by Apollo50 from Game Out at right time of year Great game to play at any time. I like these games by Casual Arts as they are always fun and brighten your mood. You will enjoy this is you have played the other games in the series, but you can just play this one without them. Rated 4 out of 5 by luskds from Love this series, but some changes are needed I love the CW series and wait eagerly each year for the newest version to be released by Big Fish. The game is good and the graphics are well-done. However, it is time to get some new kids and a new location. So many of the items and scenes seem to be a repeat from the older games. I enjoy all the games that these developers put out and like the clean, family-oriented games. Please keep the games coming, but let's have some fresh faces and ideas. Rated 3 out of 5 by deddu from NOT FOR ME The hidden objects were way too busy for me. I think younger children might enjoy the game. Try it for yourself as it seems others really enjoyed it. Rated 3 out of 5 by verimeri from too hard for kids I have always bought this series for the 8-12 year olds but this one had so many scenes that were overloaded that they had a hard time finding the objects. Even with my help we gave up on the last jigsaw puzzle. It is a kids fun game. Try to keep it at kid level. Rated 3 out of 5 by LuSlater from Meh! This one is boring!! I've played all the previous Christmas Wonderland games, so I decided to buy this one without trying the trial. That was a mistake!! Same kids, same objects to find and it was all too simple. Personally I think No. 4 was the best in the series. I think the developers are just getting too sloppy and are just recycling the backgrounds and objects and they really are not trying when it comes to the jigsaw puzzles. I'll play the trial if there is a No. 9 and if it's just the 'same old, same old' I certainly WON'T be buying! !